On my brand new Google Nexus 4, I had this problem that some contacts were merged based on their last name. 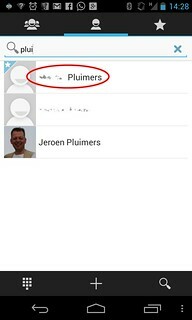 They were merged only on the phone: at the Google Contacts web page, they still were separate. The issue was very much “in my face”, as one of the merges was my brother and mother. For which I am pretty sure they are separate entities, both alive and kicking. 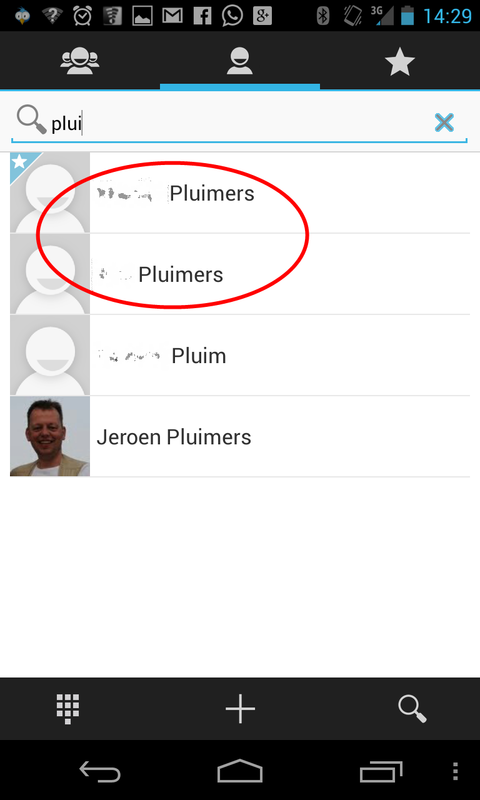 sync – Why were some of my contacts automatically merged without notice? – Android Enthusiasts Stack Exchange. 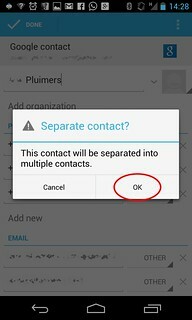 Issue 4979 – android – Contacts is merging 2 separate contacts – Android – An Open Handset Alliance Project – Google Project Hosting. 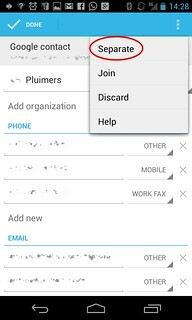 Comment #10 in Issue 4979 – android – Contacts is merging 2 separate contacts – Android – An Open Handset Alliance Project – Google Project Hosting. 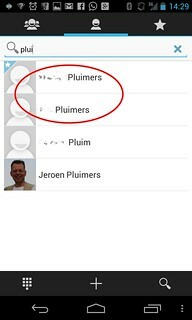 Gmail Contacts with same last name merging. The issue is still there (I synced 3 weeks ago). The solution is per device (the sync breaks on your device, not on Google Contacts). The steps of the solution were not completely clear, so below are screenshots. Click on each screenshot to get a larger crisp 768×1280 HD image. First the list of steps, then the same list with screenshots. 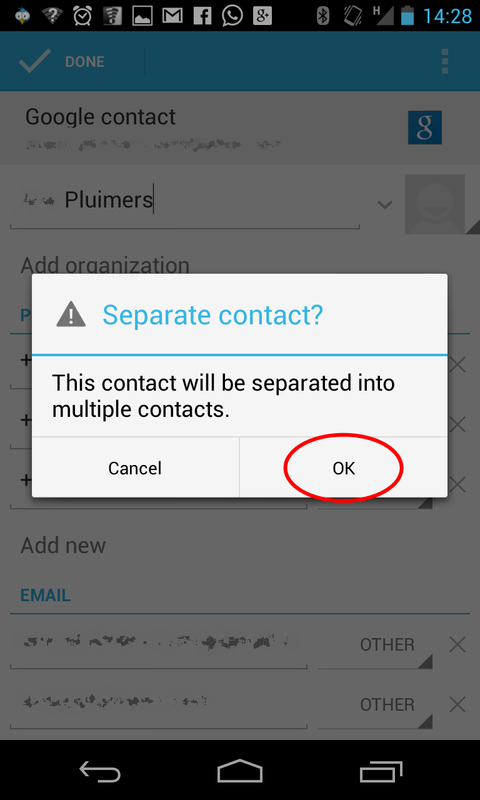 Open the Contacts on your device, and search for the one that got wrongfully merged. Click the contact to view it. Click on the edit contact to edit it. Observe that sometimes the name changes, that is because the edit shows both contacts in one big screen. Now click the triple-dot button to show the menu. 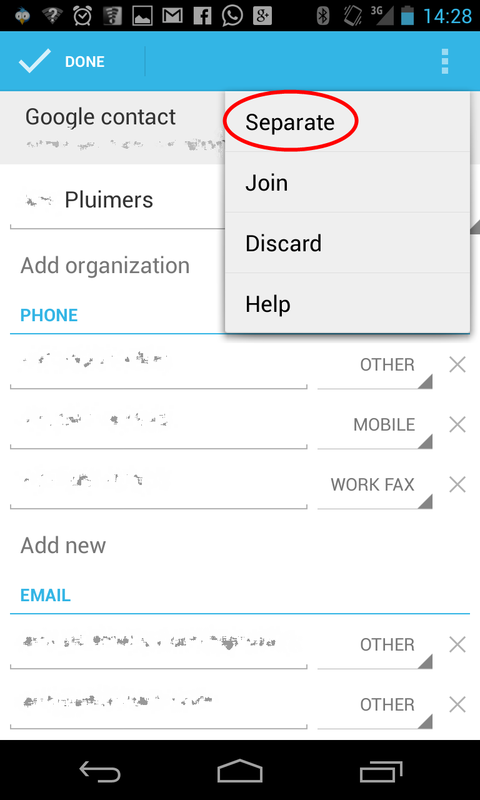 Click the “Separate” menu entry. Click “OK” to confirm the separation (unmerge). 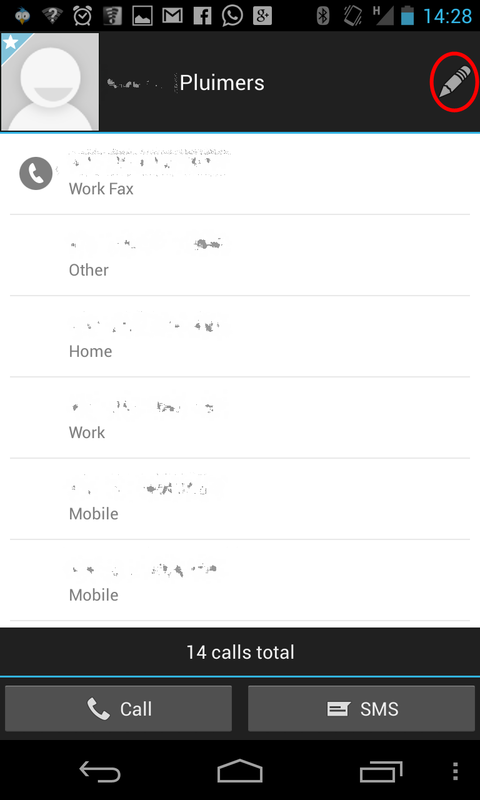 The contact is now saved (in its read-only view form) and you can still see the old “call count” at the bottom. As soon as it has been saved, you will see a new “call count” and less contact type entries. Observe you got two separate contact entries (more if Android merged really badly). 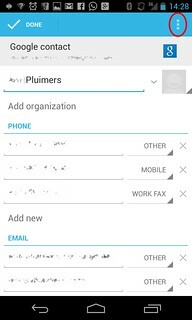 via: sync – Why were some of my contacts automatically merged without notice? – Android Enthusiasts Stack Exchange. 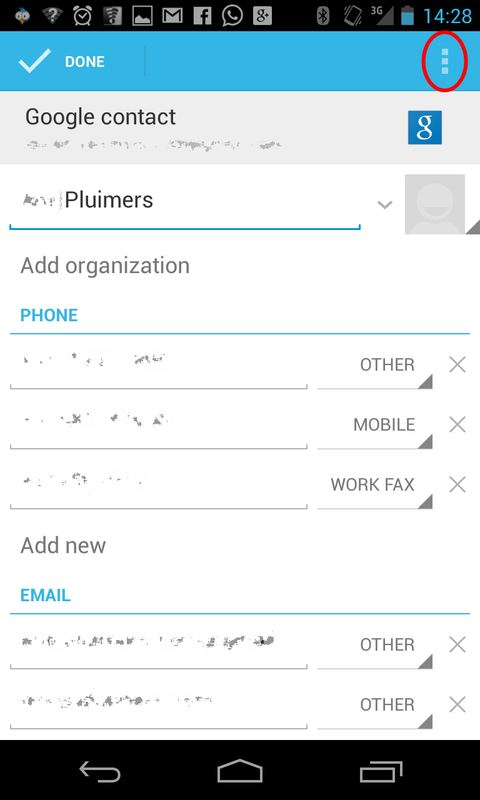 This entry was posted on 2013/04/05 at 16:53	and is filed under Android Devices, Google, Nexus 4, Power User. Tagged: gadgets, google, technology. You can follow any responses to this entry through the RSS 2.0 feed. You can leave a response, or trackback from your own site.